It was a celebration of heritage past, present and future, as Alpinestars invited about 500 of its closest friends, family, athletes and the media to celebrate its 50th anniversary at the Petersen Automotive Museum in Los Angeles on October 17. The lavish event included a veritable museum that included static displays and videos that chronicled the Italian company’s rich history in motorsports, which includes countless championships in America and around the world, on two wheels and four. 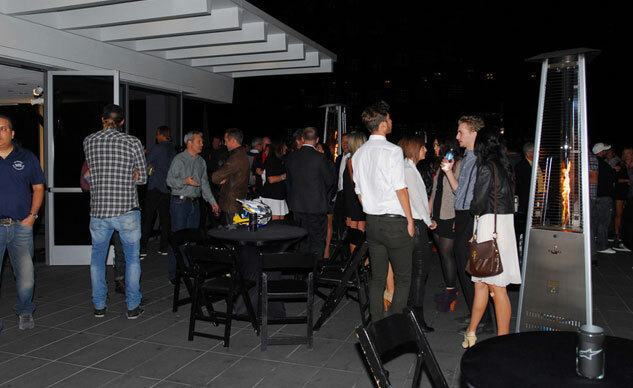 But more than the mere product, the party was a display of loyalty between the company and the people who have been responsible for its success inside and out. True to its name, Alpinestars was actually born in the mountains, as company founder Sante Mazzarolo focused his earliest efforts toward developing safer and more technically advanced hiking and alpine ski boots in 1963. The company’s name actually originates from the English translation of the Italian flower Stella Alpina, which grows in the mountains near Alpinestars’ original headquarters in Asolo, Italy. Capitalizing on his initial success, Mazzarolo soon shifted his attention toward motorized recreation. 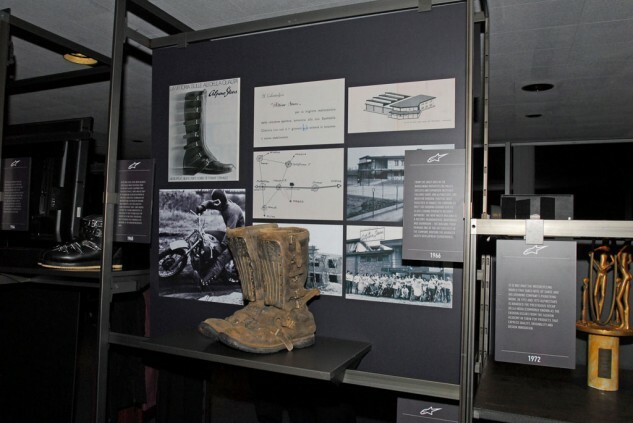 Just as most red-blooded Italians, he was a fan of motorcycle racing, particularly motocross and road racing, and in 1965 he began developing leather boots that offered innovative safety features for both disciplines. Mazzarolo’s motocross boots, which features a unique steel shin plate to protect a rider’s legs from rocks and other roost flung of the knobby rear tires of a motocross machine quickly caught the attention of some of the sport’s top moto stars, including Belgium’s Roger DeCoster, destined to become a five-time 500cc Motocross World Champion in the sport. Thus began a legacy of sponsoring athletes and working with them to improve Alpinestars products that continues today. Upon his retirement, Mazzarolo handed the reins of the company to his son, Gabriele, who has continued to guide the brand into a world power in technical safety gear and lifestyle fashion wear for a wide variety of action sports. Alpinestars currently has offices in Los Angeles and Tokyo as well as the Asolo headquarters that still serve as the company’s primary R&D facility. Today, you will see the unmistakable A-Star logo adorning champions in motorcycle racing and also in auto racing, where such stars as six-time NASCAR Nextel Cup Champion Jimmie Johnson and three-time and defending Formula One Champion Sebastien Vettel wear Alpinestars driving suits, gloves and driving shoes. The brand has also enjoyed success in the world of competitive bicycling and surfing. Throughout its 50-year history, Alpinestars’ list of athletes has included a who’s who of world-class motorcycle racing talent. 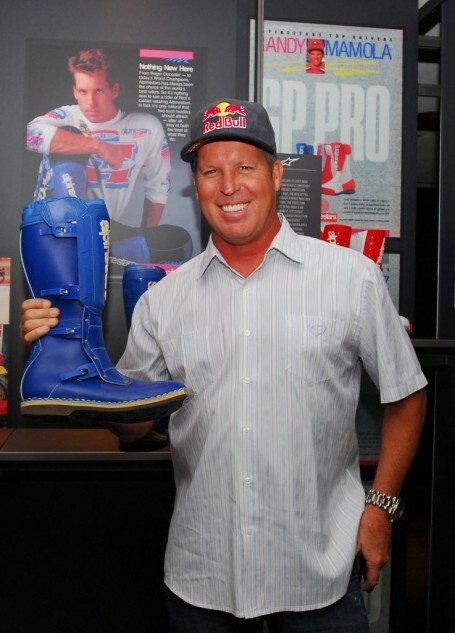 Besides DeCoster, American stars such as multi-time AMA Supercross and Motocross champions Bob “Hurricane” Hannah and Ricky Johnson and three-time 500cc World Road Racing Champion Kenny Roberts have worn Alpinestars boots. 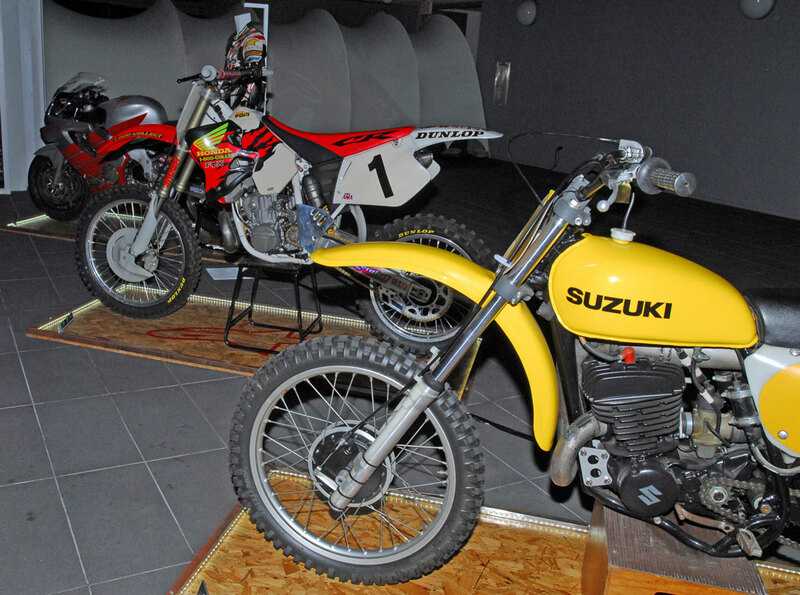 Alpinestars’ impressive display of moto hardware at the party included the factory Suzuki of five-time World Motocross Champion Roger DeCoster and the factory Honda of seven-time AMA Supercross Champion Jeremy McGrath. A great deal of the company’s success has come through rigorous R&D programs in which these athletes took part, and it says a great deal about the company’s loyalty that many of these legends are still a part of the Alpinestars family. Ricky Johnson, who attended the Los Angeles party, was an Alpinestars athlete during his rise to power on the American motocross scene in the 1980s. Johnson said that as a young rider he was immediately impressed by the company’s willingness to work with riders to develop the best products it could. “When I was wearing other brands of boots I was getting constant ankle injuries,” Johnson said. “I was contracted, and I had to wear those boots – I don’t want to say the name – but I bought Hi-Points, which were what Alpinestars were called at the time, and I wore those when I practiced all week long and then switched to the other boots when I raced. And I started fabricating my own ankle pads and things like that. Former AMA Motocross and Supercross champion Ricky Johnson shows off one of the Alpinestars boots that he helped the company develop during his years as a top-level factory racer. Johnson spent a lot of time working with Alpinestars to improve its products. The appeal of being an Alpinestars athlete is so strong that some riders, including former AMA Superbike Champion, World Superbike Champion and current MotoGP star Ben Spies have even been willing to forego lucrative contracts just to get their foot in the door. Spies had already claimed his first AMA Superbike title in 2006 when he approached Alpinestars about sponsoring him. 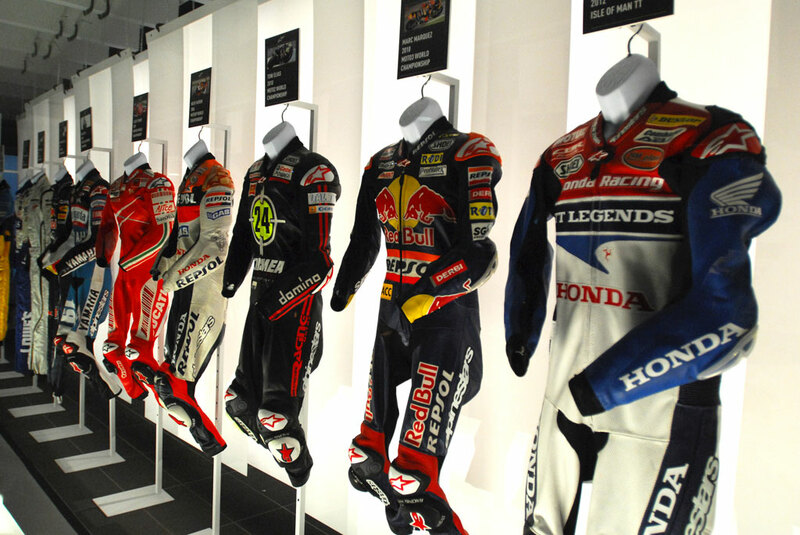 This Champions Wall of Fame display included suits worn by Alpinestars athletes such as 2012 Isle of Man TT Champion John McGuiness, Moto2 champions Marc Marquez and Toni Elias, MotoGP Champion Nicky Hayden, World Superbike Champion Ben Spies, and even Formula One World Champion Sebastien Vettel. That’s a lot of glory in one display! Spies went on to win two more consecutive AMA Superbike titles before claiming the 2009 World Superbike Championship. He is the last American to have won a MotoGP race as of this writing. All of that success came in Alpinestars gear, and he has survived some horrific crashes along the way, too. Spies said he couldn’t be prouder of his association with the company. But while winning at the top levels of motorcycle racing, Alpinestars is among the first companies to cater to amateur racers. In 1977 it was one of the first companies to offer a motocross boot designed specifically with the safety needs of youth riders in mind, and some of the company’s top athletes, such as top-ranked American Mike Alessi, have been cultivated as amateurs. Perhaps not surprisingly, boots continue to be the foundation of the Alpinestars empire, and they are praised not only for their comfort and technical innovation but for their durability as well. It’s unlikely that few racers would know more about the latter than Baja 1000 racing legend Johnny Campbell. “My relationship with Alpinestars goes back to the 1990s, racing in Baja and spending hours and hours and hours in their boots,” Campbell said. 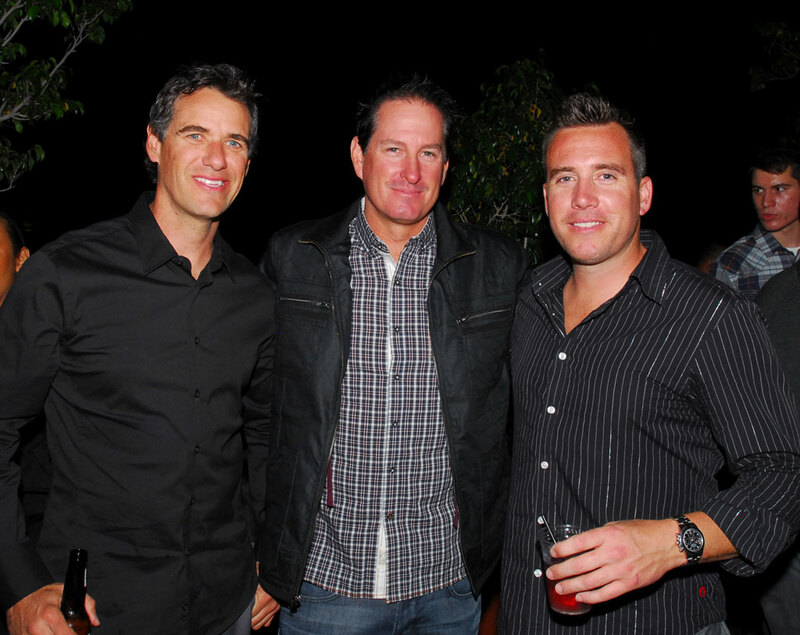 “I have 17 years of racing them, with 11 Baja 1000 wins, and they’ve never fallen apart. I’ve worn them out, but they’ve never fallen apart. But out of any of the boots I’ve worn, none of them that I have come across have ever been as comfortable and durable as Alpinestars. And, if you’re very, very strategic with foot powder and pulling the inner booties out of them after you’ve worn them for hours and hours, you can even kind of manage the smell,” he laughs. While loyalty by any company’s sponsored athletes is to be expected, the vibe at the Alpinestars party was one that is often shared among many of the industry’s most iconic brands: More than mere profit, there is an overwhelming sense of family and community that drives the Mazzarolo family and inspires the company to continue to break new ground with its products in the interest of bringing the athletes who wear them back safely every time they take to the track. According to company spokesman Chris Hull, now is as good a time to be involved with Alpinestars as any time in its 50-year history. Alpinestars’ display included several heritage videos that allowed attendees to plug in and watch past Alpinestars athletes compete. And where does the company go from here? 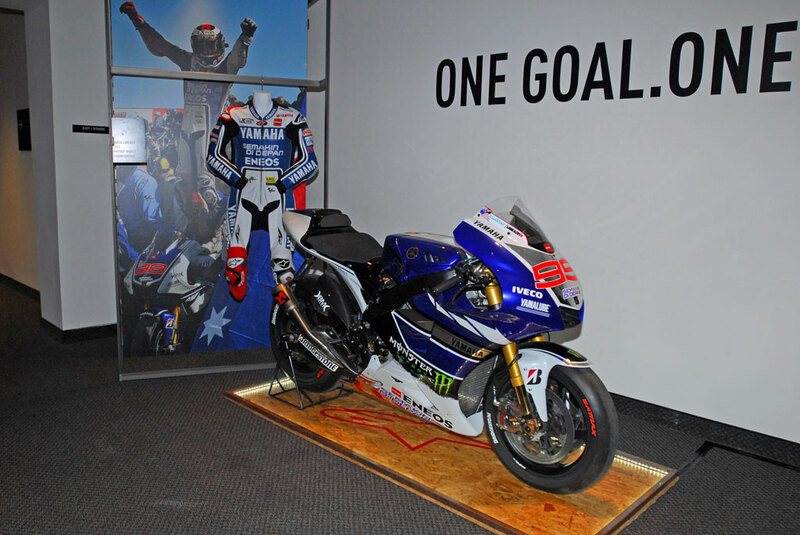 Reigning MotoGP Champion Jorge Lorenzo’s Alpinestars racing suit and factory Yamaha MotoGP machine guarded the door at the Alpinestars party.